OPI’s Original Nail Envy Nail Strengthener has added delicate, feminine color for the very first time. Infused with hydrolyzed wheat protein and calcium, the new Nail Envy Strength in Color Collection delivers maximum strengthening aid to transform weak, damaged nails into longer, stronger, harder nails. 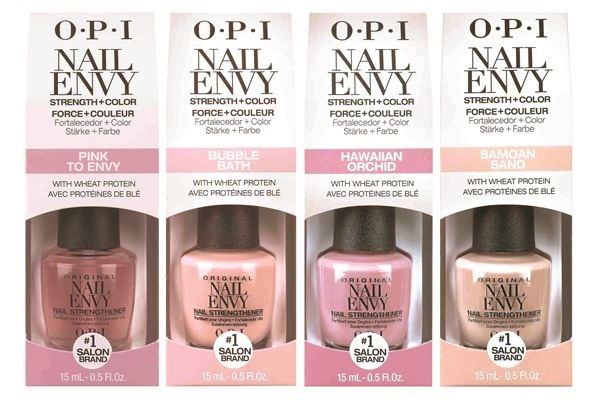 The collection includes classic OPI favorite shades like Hawaiian Orchid, Samoan Sand, and Bubble Bath, plus a Nail Envy-only exclusive offering, Pink to Envy.